Regional leadership on migration would result in less of the likes of Boris Johnson and Nigel Farage, and more of people like Sadiq Khan and Nicola Sturgeon. 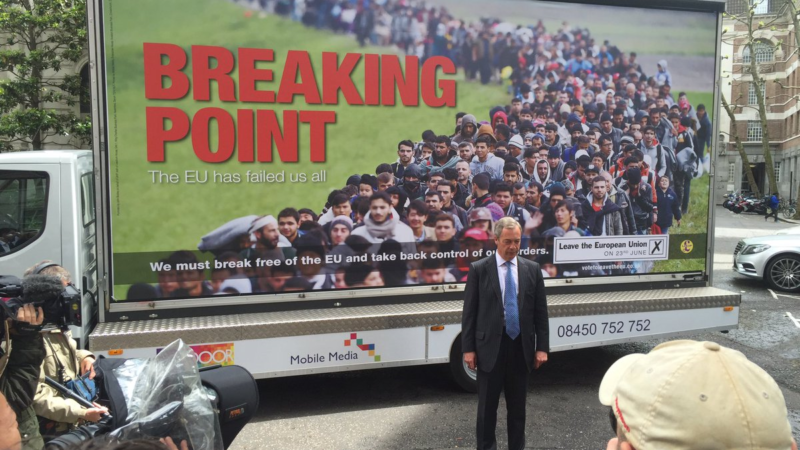 Pic: Would regional migration policies end the appeal of Nigel Farage? ‘It’s like this mad riddle.’ Thus spoke Danny Dyer, the sage of Brexit. He wasn’t wrong. Nowhere are the contradictions thrown up by the Brexit vote more evident than on immigration. They range from how to ‘take back control’ of migration while not cutting numbers so precipitately that skills gaps cripple public services and drive businesses to the wall, to the risk that the EU’s red line on freedom of movement is so egregiously breached that the broader Brexit deal is derailed. At the heart of the riddle is an impossible question on the right number of migrants to be allowed into the UK. The most significant area of migration is people coming to the UK to work (as opposed to those who come study, or for family reunion or asylum) and on this, whether Tory or Labour, the government has a choice of three policy options, each a wrong answer. Option A: Set a numbers target that is so low as to be either unattainable or disastrous for the public services and the economy. The past eight years have tested this approach to the point of political destruction. It’s difficult to imagine a scenario more corrosive to trust in politicians on migration than the way the government has stuck to its target of cutting migration to the tens of thousands, while continually missing it by huge margins. It raises migration as an issue and then casts the government as incompetents or liars, not prepared to do what’s required. Option B: Set a target high enough not to buckle public services or hit economic growth but one that then opens the government to charges of allowing uncontrolled immigration. The political incentives for opposition parties are too great to pass up the opportunity of attacking on this issue, particularly in an era of hung parliaments, to say nothing of the far right whose members are salivating at the prospect of shouting betrayal on immigration. Option C: Don’t set a target but try to assure voters that migration will be managed through a rigorous process. That hardy Labour perennial, a ‘tough, Australian points based system’ is a perfect example. Labour’s poll rating on migration is an equally good measure of the effectiveness of this approach – for the past eight years in YouGov’s regular tracker, the Tories have remained solidly ahead of Labour, despite the obvious disaster of the their migration target. Since the EU referendum there’s been some recourse within Labour to try to focus on skilled migration while advocating for restrictions on low-skilled migration as an alternative approach. But this just leads back to the same underlying choices. The division between what’s considered a high and a low skill in Britain’s current non-EU immigration system is based on the salary earned by the worker. Those who earn £35,000 or above are classified as high-skilled workers. According to this exceptionally crude dividing line, roughly 75% of the UK workforce is categorised as having low-skill jobs; this group includes nurses, teachers and scientists. Sticking to this definition of skills leads to option A. Setting a target based on a more realistic view of what constitutes high, medium and low skills leads back to option B.
There’s seemingly no escape from the numbers game. But as with most riddles, the path to finding the answer lies in changing one’s perspective. Control has always been viewed through the prism of central government. Yet control doesn’t have to be centralised. What if the balance between central and regional control was shifted decisively in favour of the latter? English city regions, England’s combined authorities, regional government in Scotland, Wales and Northern Ireland – this tier of devolved governance could take a leading role in setting the level of migrant labour required for their region, based on consultation with businesses and unions and local economic analysis. Regional work permits would then be issued in line with these priorities. The referendum result revealed a deeply divided nation and the answer is surely not to impose a one-size-fits-all solution for the country on an issue such as migration where there are such different views in different regions. Devolving decision making on migration to a regional level would localise control over numbers, enabling flexibility for contrasting priorities across Britain to be accommodated. Regional leadership on migration would result in less of Boris Johnson, Michael Gove and Nigel Farage and more of Sadiq Khan, Nicola Sturgeon, Marvin Rees, Steve Rotheram and Andy Street. Less of the Sun and Daily Mail, more of the Yorkshire Post and Birmingham Evening Mail. Less of the CBI and more of regional employers and regional union leaders with direct ties to the people impacted by decisions. Politically, the move to a regional policy would finally enable national government to dispense with the destructive numbers target in as painless a manner as possible. The national debate where the Johnsons, Goves and Farages are active would be reframed around the process of regional democratic control rather than the current obsession with numbers. Those who argued for a top-down target set by central government would be denying regional accountability. The power of the argument in favour of an EU referendum in the 2010–2015 parliament was that to oppose it entailed denying people their say. It’s part of the reason why the campaign for a second referendum is gaining traction. The same holds for devolving policy on migration numbers to regional governance that is democratically accountable to its voters. It is much harder for far-right agitators to talk about an establishment betrayal or lack of public control over migration in this context. At the same time, if this policy was implemented post Brexit, access to the UK labour market for EU citizens would likely not be hugely impacted given the high level of overlap between areas where the local economy has skills gaps and needs migrants and positivity on migration. London is the obvious example, where over 40% of the UK’s migrants live. Regionalising migration policy offers a singular opportunity to solve the Brexit riddle and take migration as a national issue, with all of the poisonous debate that surrounds it, permanently off the table not just as a political mechanism, but as part of a change that brings power nearer to voters and improved accountability. All that’s needed is for progressive politicians to have the courage to think beyond the bounds of Westminster and Whitehall. Atul Hatwal is director of the Migration Matters Trust. This piece is taken from Compass’ new report “The Causes and Cures of Brexit.” Read it here.